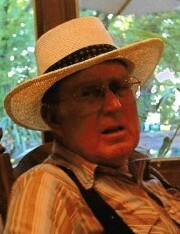 Thomas Wayne Lee, 81, of Boonville, passed away at his home on March 28, 2019. He was born March 27, 1938 in New Franklin, a son of Walter “Banty” Lee, Jr. and Mary Eatherton Lee. Thomas married Charleen McKinney on November 23, 1963 in New Franklin. She survives at their home. Thomas was a retired truck driver. He had served as a volunteer fire fighter with the Boonville Fire Department and enjoyed going to the boat, making friends there and serving as their volunteer “social director.” Mr. Lee was also a U.S. Army veteran. In addition to his wife, Charleen, he is survived by a son, Todd W. Lee and a daughter, Sherry Scruggs and spouse, Berry all of Boonville; a sister, Patricia Lee of Kansas City, MO; nieces and nephews; other family members and friends. Also surviving are his canine companion, Miss Kay and his feline companion, Man Cat and his grand-puppies, Snoopy, Zeus and Zena and grand-kitty, Bull Winkle. He was preceded in death by his parents and a sister, Carolyn Pihana. Funeral services will be held at 1:00 PM, Monday, April 1, 2019 at Markland-Yager Funeral Home in New Franklin with Rev. Roger McMurry officiating. Interment with military honors will follow at Mt. Pleasant Cemetery in New Franklin. Visitation will be Sunday evening from 5:00 – 7:00 PM at the funeral home. Memorial contributions are suggested to Central Missouri Humane Society or Second Chance.